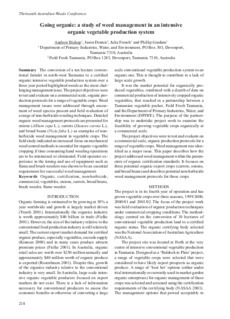 The conversion of a ten hectare conventional farmlet in north-west Tasmania to a certified organic intensive vegetable production system over a three year period highlighted weeds as the most challenging management issue. The project objectives were to test and evaluate on a commercial scale, organic production protocols for a range of vegetable crops. Weed management issues were addressed through assessment of weed species present and field evaluation of a range of non-herbicide weeding techniques. Detailed organic weed management protocols are presented for onions (Allium cepa L.), carrots (Daucus carota L.), and broad beans (Vicia faba L.) as examples of nonherbicide weed management in vegetable crops. The fi eld study indicated an increased focus on mechanical weed control methods is essential for organic vegetable cropping if time consuming hand weeding operations are to be minimised or eliminated. Field operator experience in the timing and use of equipment such as fl ame and brush weeders was shown to be an essential requirement for successful weed management.